If Immigration and Customs Enforcement (ICE) has access to Chicago police’s gang database, is Chicago really a “sanctuary city”? “My family was separated by ICE,” read a sign held by Celene Adame at a press conference in Nov. 2017 outside Chicago’s U.S. Citizenship and Immigration Service (USCIS) building where she was giving an update on Wilmer Catalan-Ramirez’s case. Catalan-Ramirez is Adame’s partner and father of her three children. He was arrested by Immigration and Customs Enforcement (ICE) officers eight months earlier in their home in Back of the Yards. “These have been eight long and difficult months without him,” Adame said. “I will continue to fight for his freedom,” adding that it’s their children who are suffering most. Catalan-Ramirez has an ongoing federal lawsuit against ICE agents and Chicago police officers, challenging his inclusion in the city’s gang database and violating his civil rights. His arrest, based on being labelled a gang member put him at odds with Chicago’s Welcoming City ordinance, the suit alleges. The ordinance protects undocumented immigrants but not those who are gang members. “A gang database and the idea of a sanctuary city cannot co-exist,” said Vanessa del Valle, an attorney with the MacArthur Justice Center and Clinical Assistant Professor of Law at the Northwestern Pritzker School of Law. 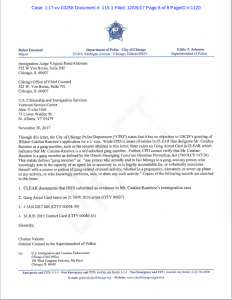 Official CPD letter indicating that police have no information that Catalan-Ramirez is or was a gang member, adding that police would not object if he were granted a visa allowing him to remain in the U.S.
As the suit pended, on Nov. 30, the Chicago Police Department’s General Counsel sent an official letter to USCIS and to the federal immigration courts, indicating that CPD has no objection to issuing Catalan-Ramirez a U visa, conceding that police cannot verify that Catalan-Ramirez is a gang member or that there is any record of him being one [see letter to the right]. U visas are set aside for immigrants who were crime victims and who assist law enforcement in investigating or prosecuting criminal activity. There is no guarantee that the police department’s position will result in Catalan-Ramirez obtaining a visa or in his ability to remain in the U.S. or even be released from detention. Chicago became a sanctuary city more than 30 years ago in 1985, when then-Mayor Harold Washington issued an executive order which prohibited city employees from assisting in immigration enforcement. To this day, Chicago remains a sanctuary – through its Welcoming City ordinance – for undocumented immigrants, despite President Trump and Attorney General Sessions’ crackdown on sanctuaries and continued efforts to cut federal funding to such cities. Mayor Rahm Emanuel has defended Chicago’s sanctuary city status on various occasions. “Chicago will not let our police officers become political pawns in a debate. Chicago will not let our residents have their fundamental rights isolated and violated. Chicago will never relinquish our status as a welcoming city,” Emanuel said earlier this year. Chicago’s sanctuary city policy — one that should protect law-abiding residents regardless of their immigration status — failed Catalan-Ramirez. “The sanctuary city ordinance as it stands now does not prohibit communication with the federal government,” del Valle said. Even under the Welcoming City Ordinance, CPD can share information about an individual’s immigration status with federal authorities but only if the person in question has an outstanding criminal warrant, has been convicted of a felony, has an open felony case or has been identified as a known gang member. Catalan-Ramirez’s future remains unknown as he waits in the McHenry County Adult Correctional Facility where he has been detained since March, after six ICE agents raided the Guatemalan immigrant’s home in Chicago’s South Side Back of the Yards neighborhood. How ICE ended up at Catalan-Ramirez’s front door is a real mystery, and one that has resulted in the complaint filed in September. In January 2017, Catalan-Ramirez was a victim of a drive-by shooting that left him with a fractured skull, traumatic brain injury and partial paralysis on his left side. Two months later — according to the lawsuit — six ICE agents showed up at his home, raided his property without a warrant or consent, and used force against Catalan-Ramirez, further injuring him. Catalan-Ramirez’s lawsuit isn’t the only ongoing federal suit challenging the Chicago database, which includes nearly 130,000 names. Luis Pedrote-Salinas alleges he was falsely labeled as a gang member by CPD after he was arrested at 19 years old for having an unopened can of beer in what CPD deemed “gang territory,” according to his lawsuit. ICE agents raided Pedrote-Salinas’ home on the Southwest Side of Chicago in 2011 as part of ICE and Homeland Security Investigations’ campaign called Operation Community Shield, which targets foreign born members of violent street gangs. While in detention, Catalan-Ramirez’s health has been deteriorating, according to Xanat Sobrevilla, an organizer with Organized Communities Against Deportations, which is campaigning to #ErasetheDatabase. But more than anything, she said, Catalan-Ramirez just wants to be reunited with his family – which is also what Celene Adame and their children want.